That looked exactly how you do in that photo below when he’s wasted and high off his arse. Remember when Jin was banished to L.A. oh so few years ago? Then this photo and this photo showed up. Well low and behold, new one’s have surfaced, and you know what, we are so happy about it. Why? Because for the longest time, we were beginning to think K-Pop was the only industry that had interesting gossip stories. “The string of “drug scandals” from Oshio Manabu and Sakai Noriko are still dragging on in the entertainment industry. 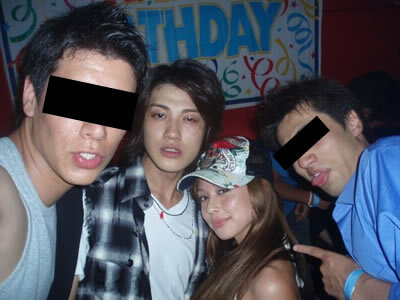 We’ve all seen the Cyber Nori-P ‘tweaking DJ play” video and there are stories of clubs and outside raves being shown as hotbeds of drugs, but now some old pictures of KAT-TUN’s Akanishi Jin have surfaced again and are causing a stir. The pictures of him with singer BENI, who he was rumored to have dated at one point, and another with him real close with another half-Japanese girl have made him into someone who shocks his fans. But more than that, what’s crazy is his face. But whether Akanishi himself knows that the pictures have leaked, it’s amazing how he hasn’t changed a thing about his lifestyle. In this crazy lifestyle, at once point “best friends” Yama-P and actor Shirota Yuu have now turned on him, and now he spends his time with former tennis player Miyao (who was arrested for drugs last year) and former NEWS member Kusano. Thank you whoever on facebook for posting these and making us love Jyani’s again. Because really, we were getting really tired of all the netizens anti’s in K-Pop. I’m going to call this person B-san, because it’s anonymous. So B-san has brought us some new news regarding KAT-TUN member, Akanishi Jin. Apparently Jin has been spotted at a bar in Roppongi with a happa (1/2 Japanese) girl. It seems like the two have been good friends for a while as they were seen drinking together. From what B-san says, the same thing happened with another girl at previously. It was just past midnight and she saw the owner of the shop happily chatting with him and some friends that include Yamapi, Ryo Nishikido and Shirota Yuu and the guards. It seems like everyone was having a good time, because the table was filled with foreigners as well. That same girl is now being seen with Jin in a cap to cover her face, had fair skin and looked pretty. The girl was also seen dancing on the table and Jin and co seemed to enjoy watching her. B-san couldn’t really understand, but says that Jin, the girl and the staff were talking in Japanese and English. From an insider, the girl is a ½ Japanese studying in America and returned to Tokyo for summer vacation. 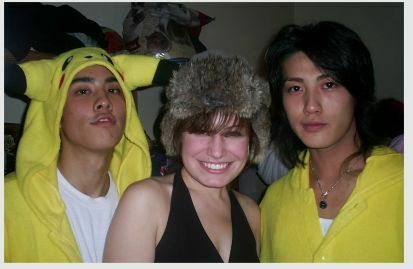 Also that Jin seems to have met this girl in America and meets her whenever he is off. This new girl is also the talks of the new “girlfriend” and they’ve been seeing each other for a while. Which kind of goes with B-san’s earlier statement saying that they seem like good friends? It seems to be a trend with JE members that having an “egotistical character” is attractive to foreigners. Namely Jin, and his many relationships he’s had when he was here in L.A.
“Jin loves foreigners. It’s said that he is close friends with Yuu Shirota, and that Yuu introduces these girls to Jin; also he takes them for okonomiyaki. In the past it’s been known that he goes out with happa girls that are good looking. Not just that but people have seen him favor the tall, white, pretty girls,” said C-san.